How we spent our Sunday afternoon. You might have picked up from the blog that I am a bit of a sports fan. Hockey, football, basketball. College or pro. I am a ticket-buying, jersey-wearing, road-trip taking, yell-at-the-TV, never-miss-a-game fan. For me, sports is the ultimate form of escapism. You get to spend two or three hours completely wrapped up and emotionally invested in the outcome of a game that, in the end, really doesn’t affect your life. Sure, the result can fill you with adrenaline or drop you into a temporary funk, but those feelings fade quickly, at least for me. It’s those two or three hours, when the outcome is still in doubt and when you can set aside all your stresses and worries and just focus on what is really a child’s game, that I treasure. That is my escape. For me, one of the great joys of being a parent is watching my kids develop that same attachment to sports, and sharing it with them. That’s what made the Devils’ unexpected run to the Stanley Cup Final last spring so magical — we shared every high and low along the way as a family. That in this one aspect of our lives we barely have to make an accommodation for autism is a pretty nice benefit, too. 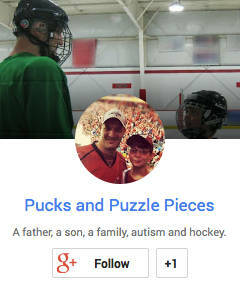 Ryan’s growing interest in football has been the only upside of the NHL lockout this fall. It strengthens the bond we already share over hockey and provides us more opportunities to spend quality time together. Every so often, there is a moment that crystallizes that growing bond, and I was lucky enough to experience one yesterday. Veronica and Riley were off at soccer, so Ryan and I had the house to ourselves. 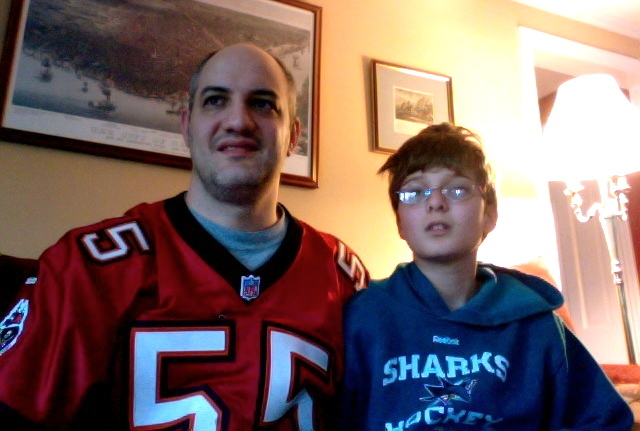 His Jets didn’t play until 4, so at 1 we turned on my favorite team, the Buccaneers. We set up shop right next to each other on the couch. I showed Ryan how to use his iPad to watch the Red Zone channel and keep an eye on all the other games. He gave me score updates during the commercial breaks. He asked a million questions, as he always does, seeking to build his understanding of this new sport. He does not ask about players, for the individuals are of little interest to him. He asks about rules, stats and trends — the things that will help the game make sense to him. Luckily, football is overflowing with all of these and so he has quickly become an expert on field-goal range, clock management and what constitutes an “offensive” or “defensive” game — among many others facets. Though he experiences the game analytically, he is not immune to getting caught up in the emotions of it. Yesterday’s Chargers-Buccaneers game was a back-and-forth affair, with the tide turning towards Tampa Bay on a long second-half interception return for a touchdown. As we watched the play develop, and started cheering the Tampa Bay defensive back, I realized that Ryan and I were yelling the exact same thing at the TV. In perfect synch, we shouted “Go! Go! Go!” at the player, and when he scored we tackled each other in a happy embrace on the couch. It was a perfect shared moment between father and son, and it filled me with immense joy. It was a feeling I wanted to bottle and preserve, and it gave me a far greater lift than anything the outcome of the game could provide. Later, Ryan despaired as the Jets lost again to fall to 3-6 on the year. I tired comforting him by saying wins would be sweeter for having experienced the losses. I explained how, as a Tampa Bay fan, I had stuck by the team even when it lost 10 or more games for 14 consecutive seasons. When the Bucs finally broke through to win a championship in 2002, nobody enjoyed it more than I did. Nothing like watching sports with your family :). I couldn’t agree more! Thanks for reading.